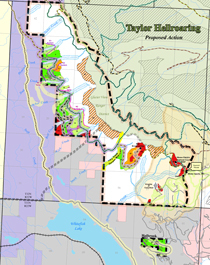 The Flathead National Forest's south end of the Whitefish Range provides habitat for threatened grizzly bear, lynx, wolverine, fisher, deer, elk, and more. 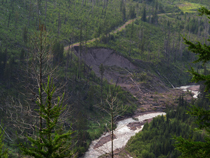 Yet the Flathead is proposing a "collaborative-based" project to harm visual quality with logging, construct 40 more miles of trail for mountain bikes, etc., and build 5 more miles of permanent logging roads. This, even though the Flathead admits the area is already so full of roads and trails it has no grizzly bear Security Core left. The Flathead is lying when it claims all this development will maintain and improve wildlife habitat and security - it will do the opposite! 1. Do not build more trails in the area. The area around Whitefish and the Whitefish Mountain Resort already provide plenty of mountain biking access. Linking all these trails together with more trails is a sure recipe for conflicts between people and wildlife that are too often fatal! 2. Do not build more roads in the area. Instead, decommission some of the old logging roads to provide security for grizzly bear and other wildlife. 3. Do not violate your own Forest Plan standards for protecting visual quality, as your proposal says your logging will do. 4. Collaboration like this does not foster "strong, more united communities," as claimed by MWA's Amy Robinson and Flathead Area Mountain Bikers' Noah Bodman, when wildlife is not duly considered a part of that community. It looks instead like this was a greedy shopping spree in our National Forest! Comments are due this Friday, April 28! For more details, see pages 4-5 of Swan View's letter regarding Taylor Hellroaring. Click here for the Flathead's full proposal and maps. THANK YOU for taking a few minutes to speak up for wildlife!